For anyone who has ever wondered what their cat does while they’re not at home, meet Lionel. This seemingly stereotypical cat turns the myth of the cat nap on its ear by living a double-life. Once his owner, Martha, leaves the house, Lionel becomes quite another kitty. An avid weightlifter, gourmet cook and avid follower of current events, Lional is quite the renaissance man, er, cat and manages to squeeze all of his hobbies (including a call to his cousin in Atlantic City) into the tiny window of opportunity left to him while his owner is otherwise occupied. 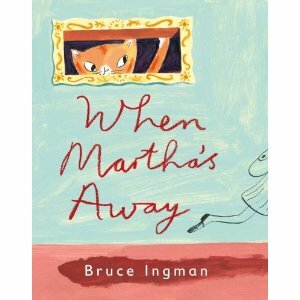 Bruce Ingman’s words and pictures are bold and bright and cheery and lend a fun and festive air to this delightful book. Children will delight in this ever-so-sneaky and sophisticated cat and might just think twice before assuming their cat lies around all day in a pile of furry repose.